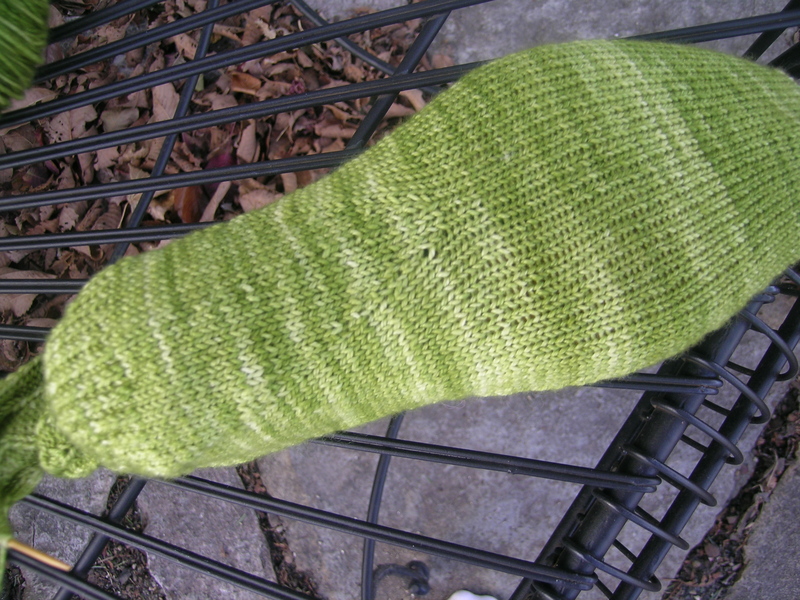 My Gardener Socks are coming along nicely. I am almost finished with the first sock. The vine pattern at the front did not seem to “pop” as much as the one in the photo, but looks okay, and better when on a foot. And I like the way that the gussets are increased at the bottom of the foot. 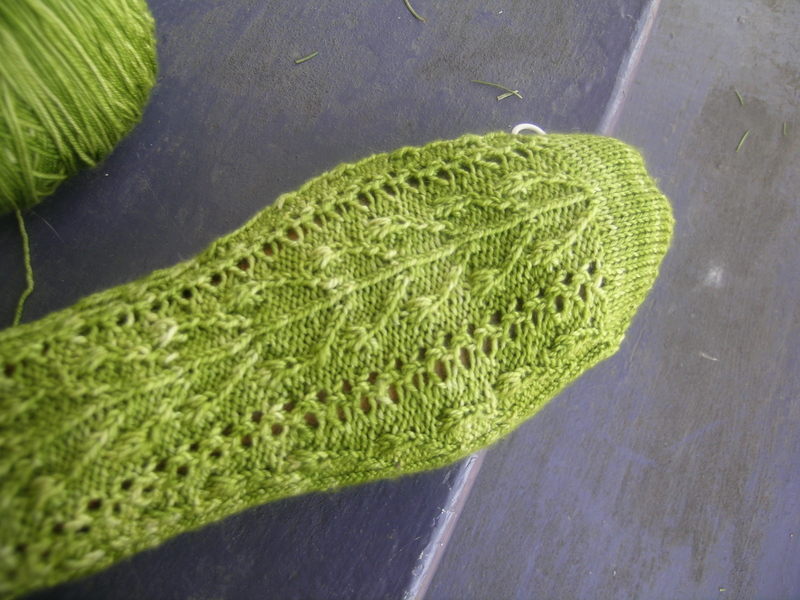 My major complaint about toe-up socks though is that you can never really measure your foot accurately, especially when doing a gussets. Look at the V increase in the foot, I probably should have started it 4-6 rows earlier, but they will still fit. 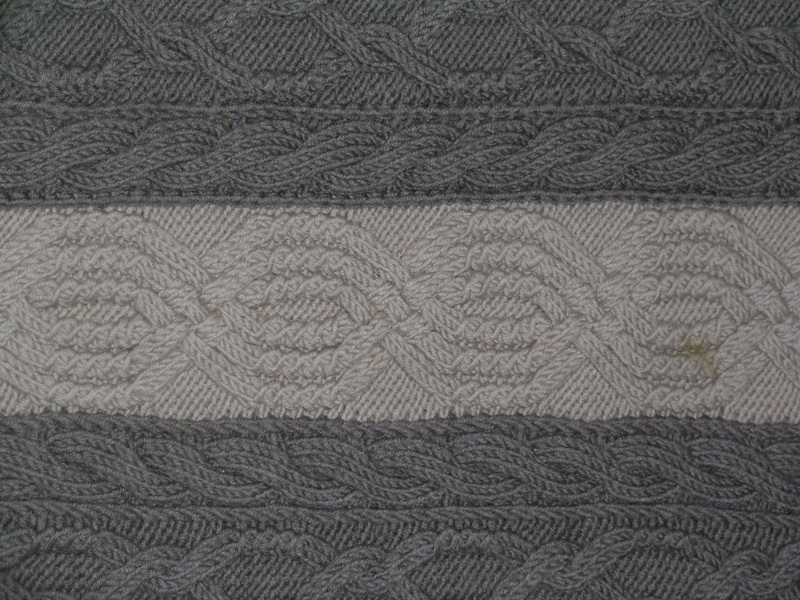 The spider motif is from one of Barbara Walkers’s Treasure of Knitting Patterns book. 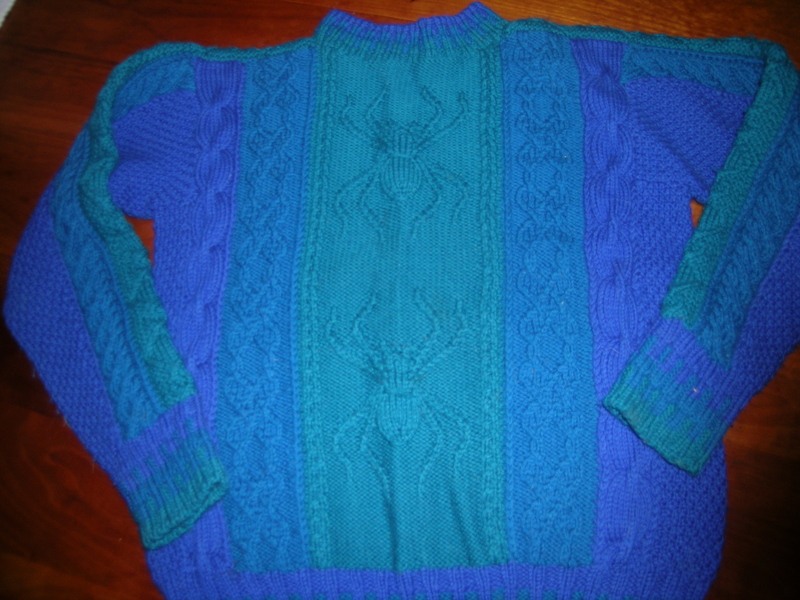 I used the same spider many years ago on a sweater that I knit, which was designed by my 12-year-old son. What pre-teenager wouldn’t like spiders on their sweater. And I am still trying to find leg mannequins, hand mannequins and a torso so that I can better photograph my projects. 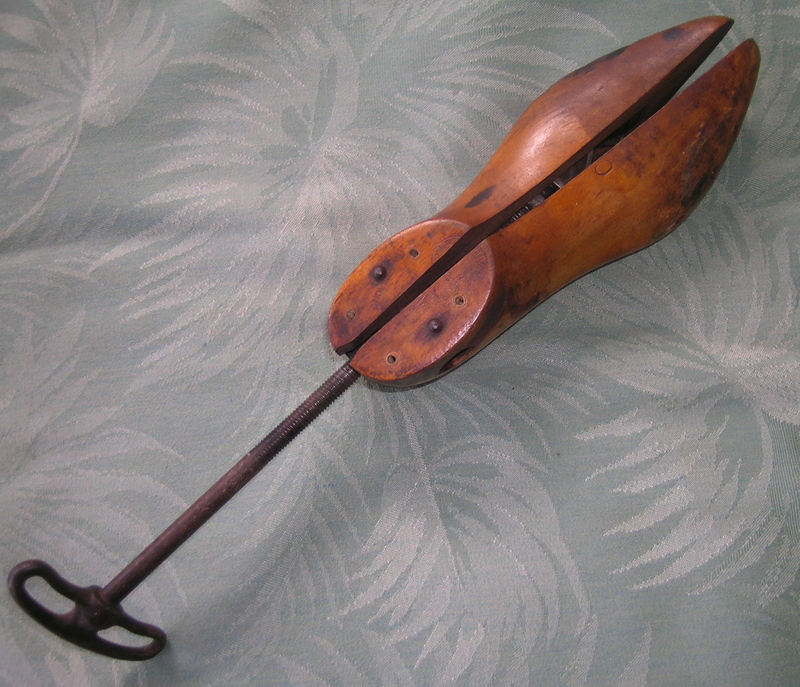 In the meantime, I remembered some antique shoemakers molds that I had in the basement and used that for my sock photography. What do you do with an old, but perfectly good sweater that nobody wants any more? I made this for my daughter when she was about 12 to wear when she was practicing figure skating. It has a slit bottom so that she could do jumps and not be constricted. She has been cleaning out her closet and brought this up to me. I am reluctant to just give it to the local resale shop. Hard to see that good work go to waste, but I do not want to store this sweater. 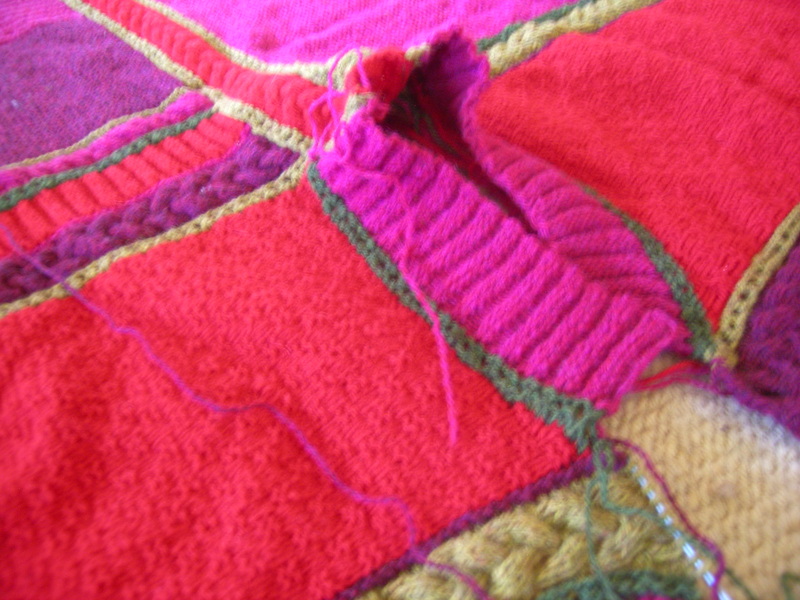 I think that I have much improved in my kntting abilities, and this is not one I would hold onto for a long time. I had washed it and blocked it a few months ago, and thought if I blocked it bigger she would wear it. No such luck. 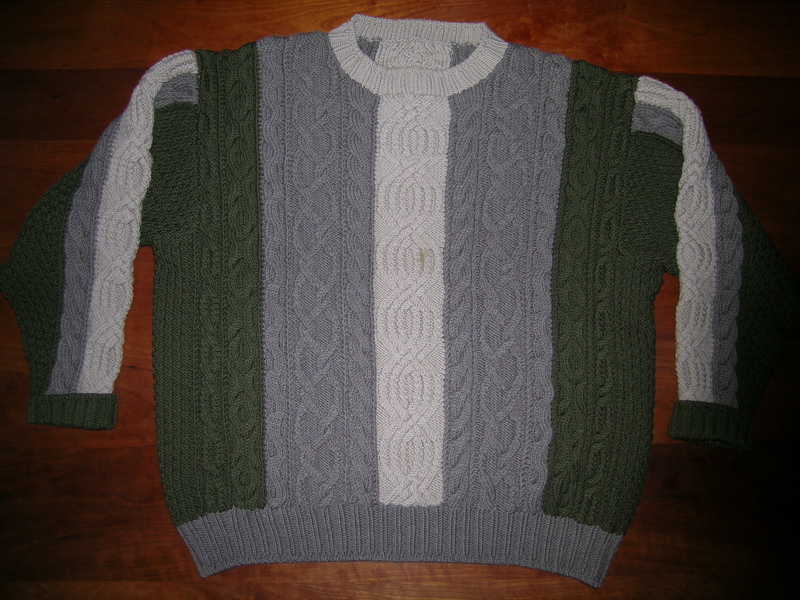 It has pretty cables at the top and bottom, and is a nice heathery 100% wool sweater. Any suggestions? You could donate it to a charitable cause? I am sure my mom could find a Somali refugee who would wear it every day through the winter! Some of the clothes you bought two years ago are still being worn by Umi and Fia. Its beautiful… maybe a local charity or promising skater in need? What a great idea Andrew! I will give it to you to have your Mom give out. Then I will know that it is truly used and loved. It’s such a beautiful sweater– im sure a young somali girl would love to look so pretty in that. pretty makes winter more bearable I think. Great idea andrew! Years ago, I purchased 2 of the original Harmony guide books. I am not sure why I did not purchase them all, as they are a great reference. Might have been because I already had all of the Barbara Walker books, and thought it might be overkill. 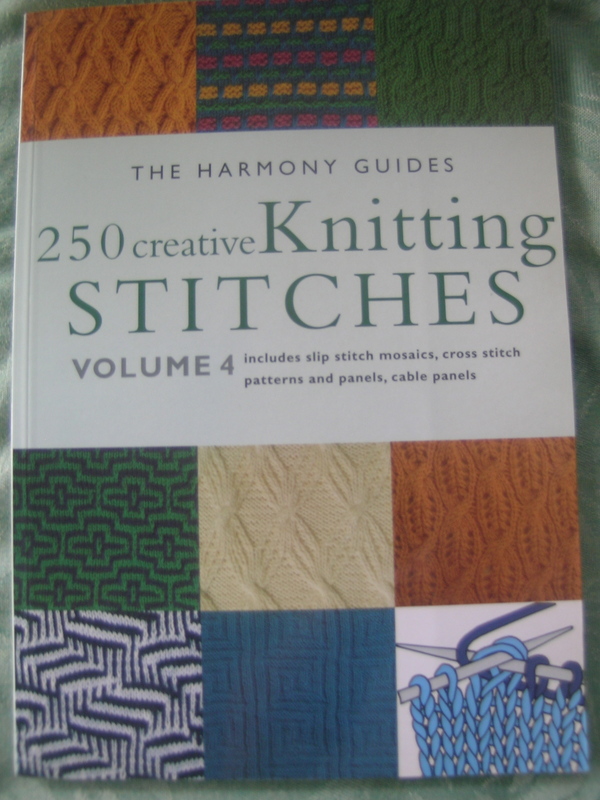 I seem to have gotten over my fear of having too many knitting books. This is one of my favorite sweaters that I have made, and I designed it myself. I love the intricate cabling on this, and it would have been much more difficult without the cables being grouped into repeat row numbers. The other books look like a fine reference, but make me wonder if I should not have purchased more of the original. 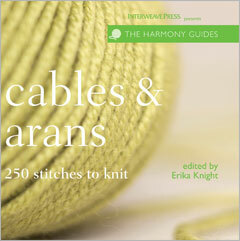 Those cables on the sweater that you knitted for your husband look amazing – so wonderfully complicated. It hadn’t occurred to me that a grouping by repeats would be sensible, but I can see what you mean. . 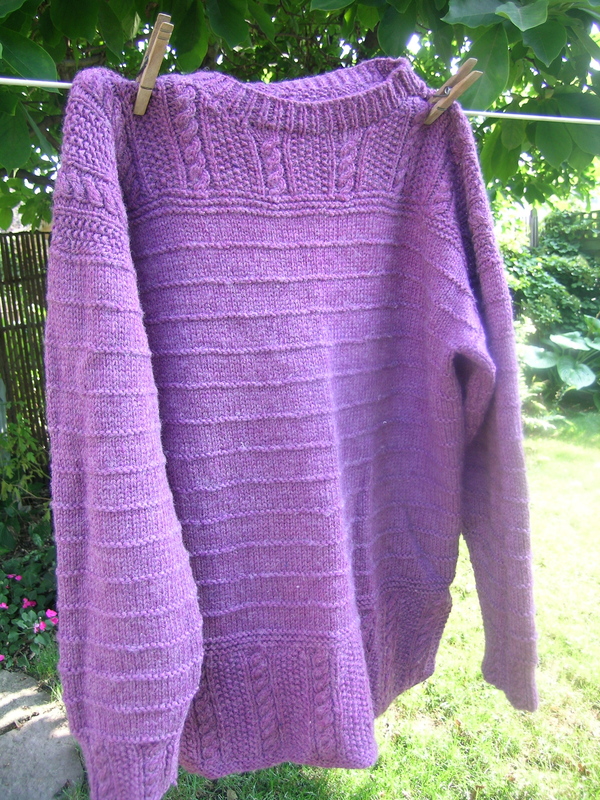 This is a sweater that I finished for my sister a couple of years ago. It is an Elizabeth Lavold design, knit up with the Silky Tweed yarn. The combination of fibers make this yarn drape so beautifully when knit up. It is light-weight, and easy to wear in moderate temperatures. 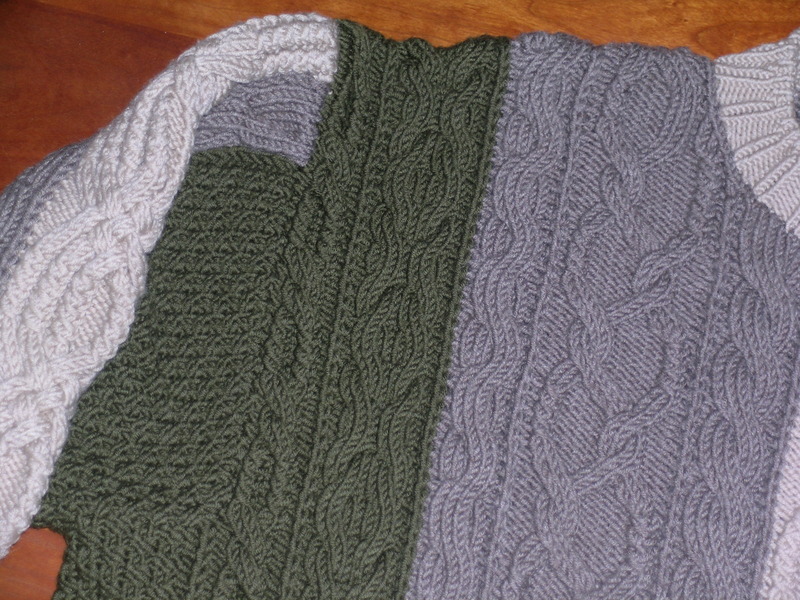 I also both like how the yarn holds the cables, and the design of the sweater itself. I have some of her yarn in my infamous stash that I need to use up, and a long-languishing UFO that really just needs to be sewn together. Seeing this sweater again first-hand makes me want to finally complete the other sweater. When I thought of that title I was so impressed with myself, that is until I realized that it was the title of the Vogue Knitting Fall 2008 magazine, where I have gotten my past few mitten projects from. I already blogged about the Yellow Harvest and the Snowbird (Let it Snow) mittens that I have made from that particular magazine issue. When I originally started looking at this magazine I questioned my decision to stop the subscription. Let’s just say, that the next issue firmed my resolve. I am currently working on 2 different pair of mittens, the Green Autumn from the above magazine and the Chrysanthemum pattern available as a free download on Ravelry from Mary Ann Stephans of kidsknits.com. 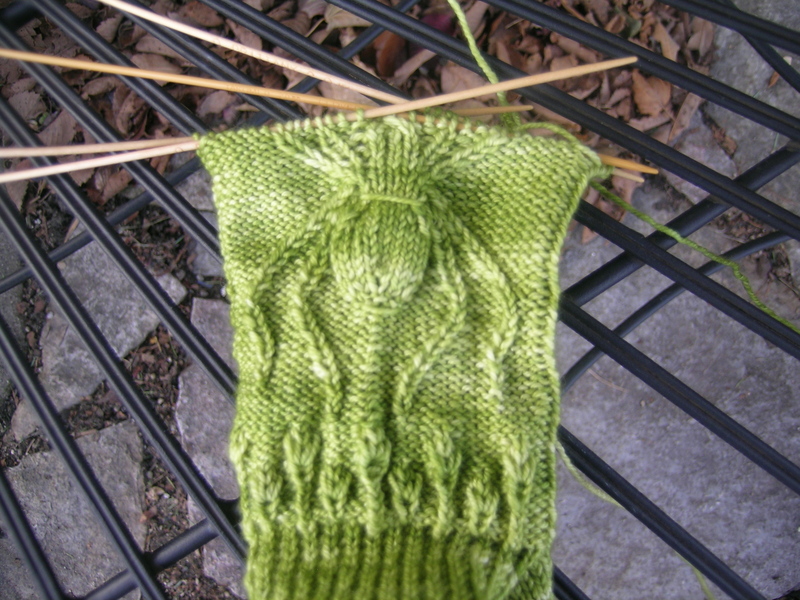 I have not gotten very far on the Green Autumn mittens. I am using Softie from Kimmet Croft Fibres. I bought this a few years back, thinking that I was short on the natural for the Bohus mittens I was making for my daughter. Never mind that they sent me an angora/Merino blend instead of the Shetland. But it was a good mistake, as I knit up these mittens with this yarn. I haven’t gotten to the main body, I need to take the pattern to the library and enlarge the chart. My eyes are not what they used to be. These I am definitely going to keep for myself. I like the pattern repeat also, it will easily allow me to make these mittens large enough for my big paws. The other mittens which I have been working on the past couple of days, are the Chrysanthemum mittens. I was looking at other patterns by Mary Ann for mittens, as that is my obsession of the month (could it have anything to do with the bitter cold winter that we have had this year?). This pattern was a free download from her website http://www.kidsknits.com, and she used Dale of Norway Heilo or Falk yarn for the project. I had originally ordered all of my Heilo for the Polar Bear sweater from MaryAnn, and not wanting to run out while on vacation, got a couple of extra balls. So, I had just enough of 3 colors to make these mittens, and they will coordinate perfectly with my Polar bear sweater. Incidentally, I wore that sweater inside twice in the past 2 weeks thanks to the bitter cold, but it is one heavy pullover, and most likely will be an outside moderate winter temp sweater—so these mittens with it would be so cute to wear with it. I am not sure however if they will fit my big hands. I used a size 1 for the cuff (pattern calls for a size 2 for the whole mitten), and a size 2 1/2 needle for the main body of the mitten. Anything larger than a 1 for the cuff made them huge. On the second mitten I learned to make a bobbin for one of the colors in the braid (in this case I used blue since it was being broken off after the braid anyway). That made it so much easier to do the braid, and not have this tangled mess of yarn. 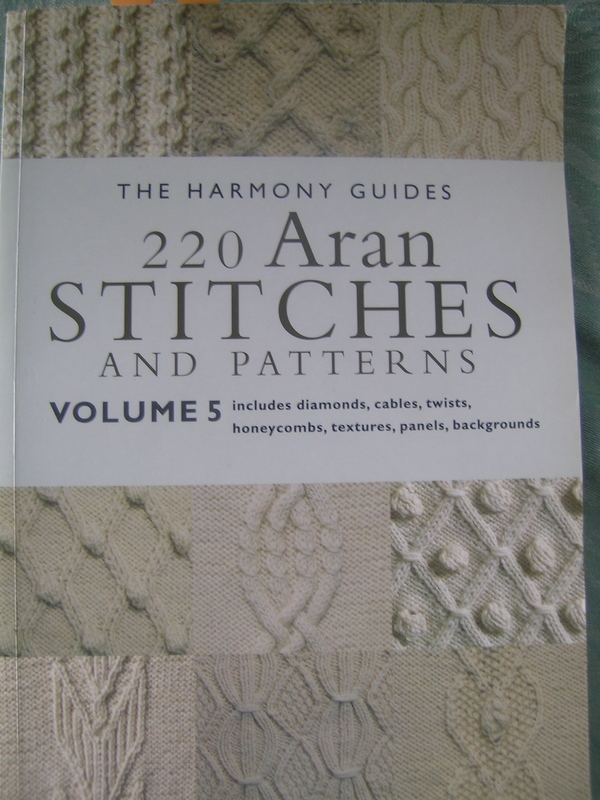 I seem to remember doing this with a class on Estonian knitting with Nancy Bush years ago. Like their sister sweater, these are very heavy mittens. In January of 2007, coincidentally enough the same time that Barack Obama was planning a run for the White House, I made the decision to make socks for the entire year and give all of them away. I was just starting the Socks that Rock sock club (which I did for 2 years). I wanted to see how many socks I could make, have them all be different patterns, and then give them away all at the same time. So, I started knitting. And as I finished each new pair of socks, I put them in a drawer. I knew most of the socks that were there, but forgot exactly how many I had made. The one exception was when a friend asked me to make socks for someone who was very ill, and we were not sure how he would do (he is great now by the way, and wears my socks whenever he knows that he will see me). January 2008 came, and I seemed to be too busy with life to get it together to pull all of the socks out and mail them off. So, I kept knitting through 2008. 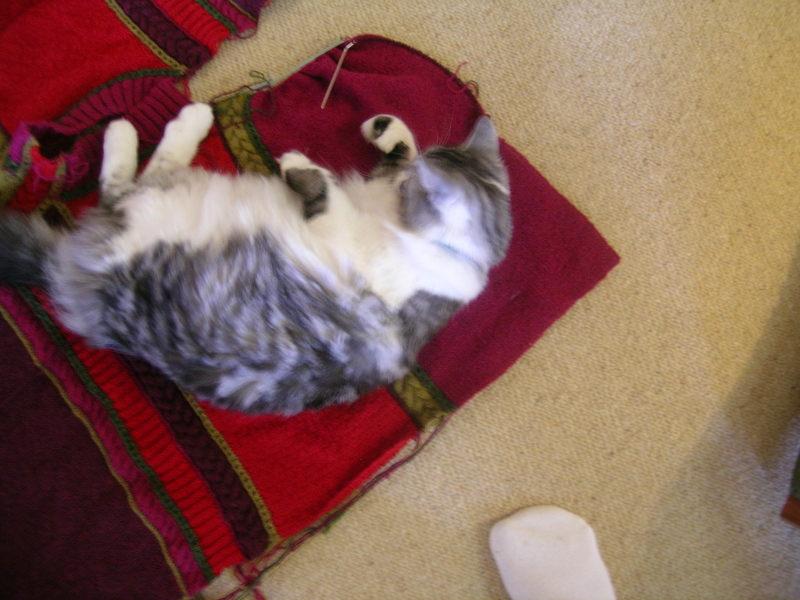 Sock knitting was interrupted by sweaters and shawls, mittens and life. But still the drawer kept getting fuller. I made little pieces of paper with names of those that I wanted to send socks to, and started matching the sock up with the recipient. Much to my surprise, I initially did not have enough people for all of the socks. I told my husband that I did not have as many friends as I thought. So, I kept them out on the table, rearranged the tags, and kept adding. Then, I suddenly found that I had more names than socks, and I had the difficult task of pulling names out. Never fear though, those people are on the list of the next recipients. I pinned the name tags to the socks and took them out a couple of times to look at the matches. My family was quite impressed with all of my sock knitting. So today, I put together the letter and placed it with a pair of socks, addressed all of the packages, and took them to the post office. The lady at the post office commented that many of the packages were to people in the neighborhood. I said that sometimes it was nicer to get a package in the mail. I also did not want to deliver these personally. Now I have given the US Post Office a huge leap of faith that all of the packages will be delivered. On my route, that would be a dubious task indeed, but I do not think that anyone is on my delivery route. I started making socks in the early winter of 2007 and I promised myself to give all of the socks that I made during that year away. I had planned on mailing them out last January, but the winter got away from me. That allowed me to add to my giveaway pile during 2008. I started this project when Obama was a little known senator seeking the presidency, and I cannot think of a more fitting time to send these off than when we now can say “President Obama”! You all have been in my thoughts, and consequently in my knitting, over the past 2 years. My well wishes and prayers are in every stitch of these socks. May these socks keep you warm and bring you comfort. Wow, what a great post! Funnily enough, today I just did a post on all of my socks that I’ve knit over the past two years. WOW! I love my socks! I love the circular photo of all the socks — it reminds me of the Wheel of Life. (No mom, not Wheel of Fortune). And I love the letter. Most of all, I love the spirit socks. Thank you for all of your kindness and generosity. I will cherish each stitch that was made with your good wishes. These mittens were made using the pattern Yellow Harvest from Vogue Knitting Fall 2008. I was not initially drawn to these mittens, but went to them after finishing 2 other pair from the same magazine, and working on a third other. I made them with Manos del Urguay, the yarn used for the sample in the magazine. I had to use size 8 double points, and I am the girl who just loves 1’s and 0’s. A size 3 seems big to me lately. I had my doubts about how warm these would be given the large guage and bulky yarn. But, they seem to be nice, and are sitting waiting to give to a dear friend for her birthday. I took the yarn, nicely wound up, 2 needle sizes to check guage, and the magazine with me when we took my son back to college, and thought that I would get these completely finished in that trip. Well, I checked guage, cast on, did the first part, and then went to look for the chart. There was a very small note that said to see page 116, where they instructed you to either look online for the chart, or send a stamped addressed envelope envelope to the magazine. When I did go online, there are several patterns from each issue that require charts not included in the magazine proper. Very disappointing, and what is one to do in a few years when those charts are no longer available. The stated rational is to keep the pages in the magazine down. I don’t buy it… if you purchase a magazine of patterns, everything that you need for those patterns should be included. I had been reconsidering not letting my Vogue subscription expire, then this happened. And 2 days later I recieved the winter issue, which was very disappointing. I think that I am going to go back to purchasing magazines only when something really interests me, and just using books and purchased patterns. I love the website Twist Collective, and that will be a new source of ideas for me. That way, I purchase only what I am really interested in. Oh, and I used up another skein of stash with this project! 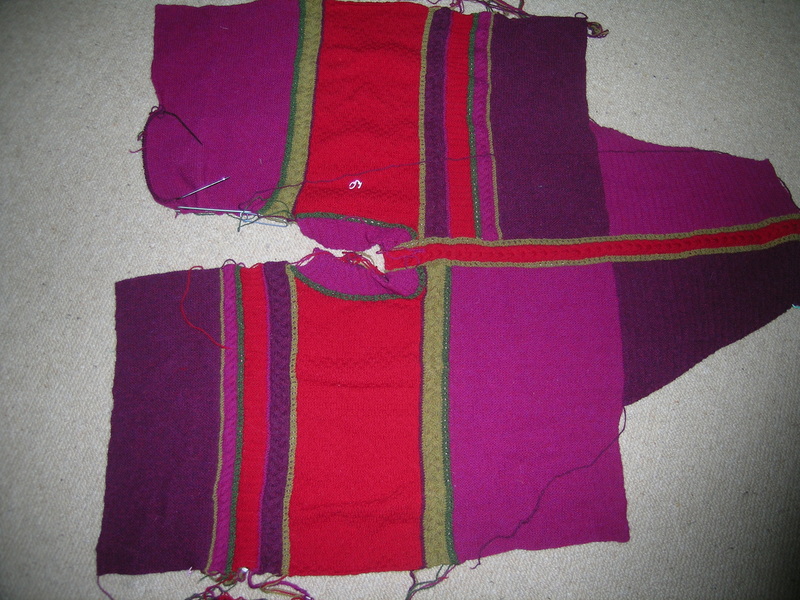 It also got me interested in going back to work on a Manos sweater that has yarn sitting waiting for it. It would be a very quick knit up. 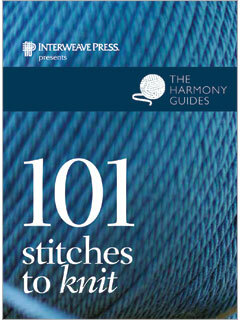 Just when I made a resolution not to purchase any new yarn in 2008, I am being sorely tested. I saw this coat on Ravelry, knitted up by one of my friends. This let me to join a wonderful new online magazine, with many great designs by many of my favorite designers. The sweater is called Sylvie, and can be purchased online. Every photo of this sweater knit up that I have seen has been beautiful. My big problem is that it used a bulky weight yarn, and I do not have the requisite quantity in my stash. I normally would never use a bulky yarn, but this pattern is changing my mind. Can I wait until 2010 to knit this up? Would it count on your New Year’s Resolution if I bought the yarn for you for this sweater–it is gorgeous. Unlike Jill, I can understand the problem of stashing as I have quite the quilt stash myself. I think I need to move more often! I loved your Christmas tree. Traver and Ethan are so much a like it is scary. Traver loves to make oragami things to and has made lots of cranes over the years. I’ll show him your tree–it was a great idea!. Mom will love the mittens–talk to you soon. Hello. I am interested in getting the pattern for this beautiful sweater that you pictured. Could you let me know where I can find it? Thanks.